the fash pack: too many events! thursday is almost always event night. that's when everybody schedules their launches, openings, galas, shows, and all other types of parties. last night, there were no less than five events: rustan's launch of a holiday collection by jojie lloren for jill and luna; havaianas launch of their first bag collection; launch of rajo laurel's limited-edition collection for wharton shirts; vicky zubiri's art-exhibit opening; and edsa shangri-la's chirstmas-tree lighting. (there could have been more we didn't know about!) we decided to go to two: rustan's and havaianas (because those were the only two we were invited to hehe). 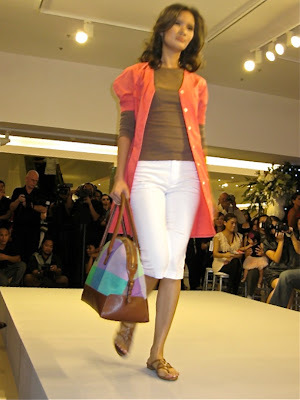 we'll first write about the jill and luna collections, which were presented at rustan's makati's gallerie section. we just snap-snap-snapped away not knowing which was jill and which was luna. we'll skip the reviews and just post some choice pieces. depending on how formal or casual your needs are, these will be perfect for your full social calendar for the next month and a half.